Modifying a domain settings is very similar to adding a new domain. You need to open Configuration section of the Admin UI and then select Update item configuration position which mentions vhost-man. 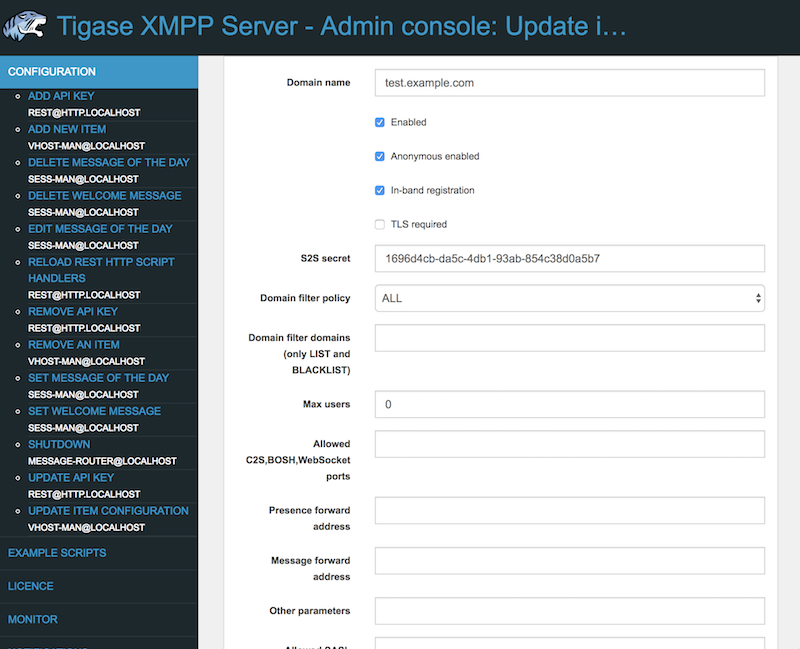 You will be presented with a list of domains hosted on this Tigase XMPP Server installation. From them you should choose the one for which you wish to modify settings. After submitting this selection, you will be presented with a the same form as the one used during adding a new domain. It presents configuration options for this domain and currently used values. Now you should adjust them as you wish and submit this form using the button below the form. As a result you will be presented with a result of this operation. If it was successful it show Operation successful message and if something was not OK, it will display an error to help you fix this issue which you encountered.